FDA Regulations Reference from C.H.I.P.S. 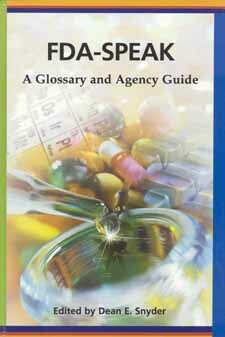 This revised and updated edition of FDA-Speak retains the original easy-to-use glossary format, but now includes more than three times the number of entries in the first edition, defining more than 2,500 acronyms and technical/regulatory words to which the FDA has applied its own distinctive meaning. FDA-Speak provides the definitive listing of all of the regulatory words, phrases, and acronyms important to development, manufacture, quality control, marketing, import/export, and registration of pharmaceuticals, diagnostic products, medical devices, software, veterinary products, biologics, nutrition and dietary supplements, and bulk chemicals. Don't miss the all-new section of appendices that will guide you to information you need on the FDA website.